If you are currently running SCCM 1810 in your setup, there is a hotfix rollup KB4486457 available. The SCCM 1810 Hotfix Rollup KB4486457 is available initially to first wave customers. It will be available later to customers who installed the globally available release. To know more about KB4486457, click here. The SCCM 1810 hotfix contains fixes that are classified into first wave issues and globally available release issues. In addition to that the update is available in the Updates and Servicing node of the Configuration Manager console. There is no restart required after installing this hotfix rollup. As always you must first install this update on a primary site. And if you have pre-existing secondary sites, they must be manually updated. 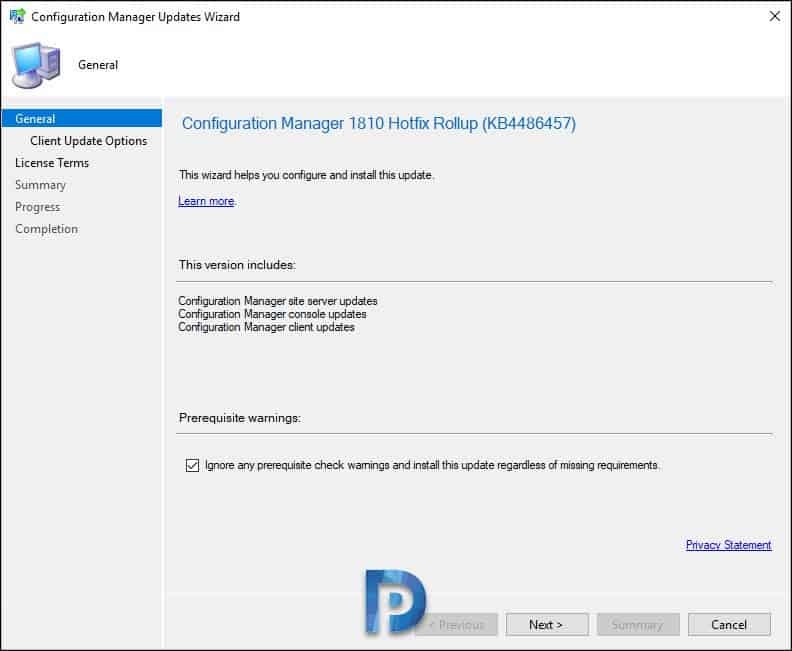 Post Configuration Manager 1810 Hotfix Rollup (KB4486457) Installation. I will cover important fixes addressed in First Wave Issues. Office 365 updates sync may fail after you update to SCCM 1810. The distribution point upgrade process may fail. Performance improvements to the Data Replication Service for device discovery data. With respect to phased application deployments, the second and successive phases of a deployment start automatically after the success of the first phase. Phased deployment deadline behavior settings are inconsistent between the Create Phased Deployment Wizard and the Phase Settings properties. The CMG content service is not created correctly when the CMG role is added after you update to SCCM 1810. A user without Full Administrator rights may be unable to create or edit Windows Defender ATP Policies. The Prerequisite Installation Checker incorrectly gives the option to retry a site installation again. Remote SQL providers who use Microsoft SQL Server 2014 or an earlier version may not always query the database. Windows Server 2016 updates displayed incorrectly while you schedule updates to a Server 2019 OS image. Some of the important fixes that are part of globally available release include. SCCM setup may fail the prerequisite check during installation or an update of a site server. This issue occurs if the environment uses SQL Always On. Hardware inventory now includes info about add-ins for Office365 and standalone Office products. Large device count – Desktop Analytics deployment plans. Sign in to Azure services fails when you use the Create Workflow in the Azure Services Wizard. Fixes a SCCM client agent installation issue – Use of metered network is not allowed. The alternative download server that is listed in the Specify intranet Microsoft update service location window is not propagated to the Group Policy settings on the client. Click Administration > Overview > Updates and Servicing. Right click Configuration Manager 1810 Hotfix Rollup (KB4486457). Configuration Manager site server updates. Configuration Manager console and client updates. You can ignore prereq checks and click Next. Click Next for rest of the pages and finally on Completion page click Close. You can monitor the hotfix installation via Monitoring workspace. Once the update is installed, refresh the console. You can also close and re launch the console. The console upgrade begins and upgrades the console. We have successfully installed SCCM 1810 hotfix rollup. The client agents will be updated to the latest version. Check this guide on how to perform client upgrade. 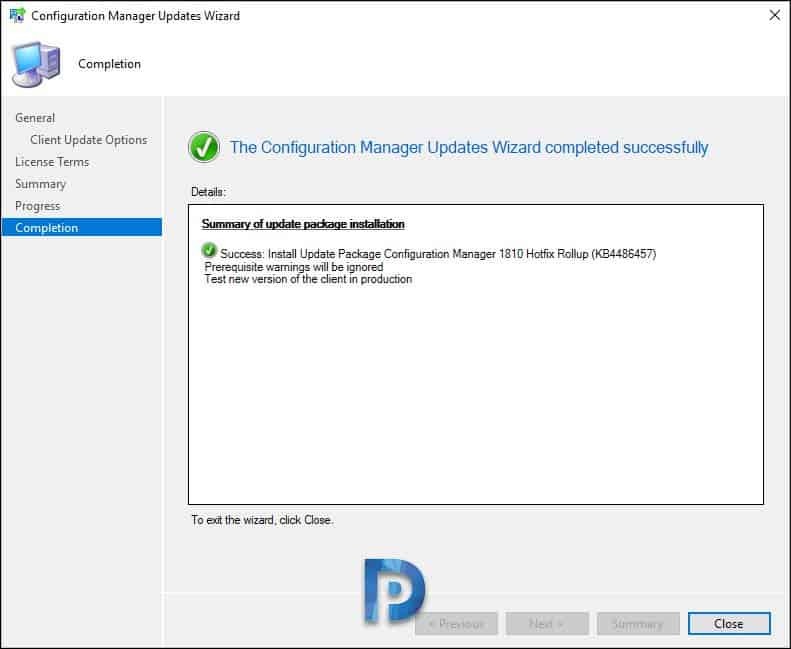 Configuration Manager 1810 Hotfix (KB4490434) never completed the Post-Installation process. This leaves the environment in an uncomfortable status Update and Servicing shows version 5.00.8740.1003 installed, but the client version is at 5.00.8740.1031. So what do we do with the boot wim update? Hi Prajwal! This update is causing some issues for me. I have a CAS and two primaries. Replication succeeded for CAS but the primaries are still in a “Replicating Content” State. DISTMGR.LOG is not showing any activity at both primary sites. Any ideas? Can I install this manually at each site? The update roll up fix has disapeared from in console , any idea why ? Was it on the same setup ?.